This is the weirdest-lookin' Lobo figure ever! Neither malevolent nor merciful, a final visitor to all yet a friend to none, Death does her job in a fashion that is both comforting and matter-of-fact. It's a job she has done since the first living thing came into existence, and only when the last living thing has died will her work be complete. Until that distant day arrives, she will be there. Waiting. Death is the second-oldest of the Endless, with only Destiny being older. She once thought she had the worst job among the family, and chose to quit - meaning nothing would die. Forced to return to work, she became hard and cold and brittle inside. This all changed when one of the souls she was collecting defiantly asked her how she would like being treated that way; to understand those she took charge of, she resolved to live for one day a century as a mortal being, and in the process became more caring and optimistic. In that regard, she was a great foil for her brother Dream, who was generally a gigantic dour mope and no fun to be around. Neil Gaiman's Death is not a skeleton in a robe or a Frederick's of Hollywood model - she is, rather, a perky goth girl, dressed plainly in black boots (actually, given a blue wash here to make them look like shiny leather), black pants, and a black tanktop. This is accessorized with a wide blue belt and a silver ankh necklace. She's small and slim, looking entirely human - as long as you're willing to look past the chalk-white skin, of course. There are a few shadows painted on the arms and shoulders, and her nail polish is black. It's no coincidence that Death was the go-to Halloween costume for so many girls in the '90s, just like Harley Quinn is today. Gaiman's original idea was for Death to look like the singer Nico from the cover of the Chelsea Girl album, but artist Mike Dringenberg instead based her on a friend of his, Cinamon Hadley. 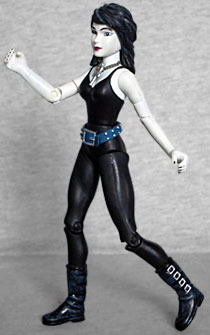 This figure, however, is based more on the art of Chris Bachalo from Death: The High Cost of Living, with a rounder face and smoother hair (too smooth, but that's a restriction of the era). She's got the trademark squiggle under her right eye. The articulation is quite poor, but that too is attributable to the fact that this is a toy from 1999. Death has a swivel neck, rendered immobile by her hair, swivel shoulders, swivel biceps, hinged elbows, a V-crotch, and hinged knees. There is, of course, no waist, despite the fact that the line between her shirt and pants would have been the perfect place to put one. Functionally, the only interesting thing you can do with her is fold her arms behind her back. It really would be nice if Mattel or DC Direct would make a modern set of Endless action figures - or better yet, wait until Hasbro buys Mattel out, so a competent company could be behind the release. 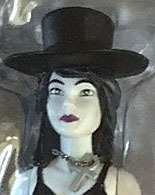 Death was released in the second seris of DCD figures, alongside Jesse Custer. That was back when every figure needed to have a variant, so Death naturally does. No, it's not her in her human form as "Didi" from High Cost of Living (though that would really only have required painting her skin pink instead of white), the variant has to do with her accessory. The normal release, for some reason, comes only with a blue umbrella, while the variant has a '90s-tastic Linda Perry-style top hat. Since resculpting large chunks of the figure was out of the question, there was no way we could get her with her leather jacket, but this still seems like a pretty unimpressive change. 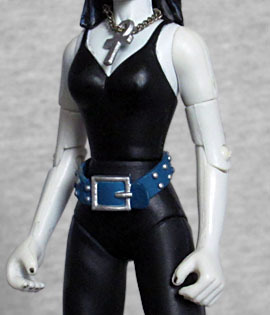 Mattel did make a Death figure of their own, but it... had problems. So really, if you want a figure of one of the most popular comic characters from the '90s, this is your only choice.